After a relaxing summer break, tomorrow is officially my first day back at work. Slowly, but surely, September has been creeping up on me. Now it’s here and I’m a bit nervous about tomorrow. My outfit has been picked out, my lunch was packed, my bags are by the door, and my keys are in the fridge on top of my lunch as a reminder. Everything in this house is screaming “It’s time to go back!,” but me that is. My head is still in summer mode. It’s slowly realizing that summer is nearly over, but it isn’t quite there yet. Tomorrow will a reality check for my head anyways. I’m feeling a lot of excitement, but a bit of nervousness too. It’s almost like I’m a school girl again with feelings of anxiety about what the first day will bring. I remember thinking “Will I have friends in my class?” and “Will my teacher be nice?” Now that the roles are reversed, I still have butterflies in my stomach. They will all be done fluttering at about 8:30 tomorrow morning, when I can finally relax and face the year ahead with open arms and a clear head. Baba ganoush, was one more recipe I wanted to cross off my recipe to do list before the summer was over. This version was creamy like hummus, but the flavors of cumin and eggplant were the most predominant (they were balanced out by the tangy flavor of the lemon). Preheat the oven to 350 degrees. Then peel and dice the eggplant. Add it to a baking pan, sprinkle with salt, pepper, garlic powder, cumin, and oregano. Drizzle the olive oil over the top of the eggplant. Mix by hand to ensure all of the spices and olive oil are evenly distributed. Then cover the pan with foil and stick it in the oven for 25-30 minutes or until the eggplant is cooked through. After the eggplant is cooked, let it cool for 10 to 15 minutes before adding it to the food processor. Add the rest of the ingredients and blend on high until the baba ganoush is somewhat smooth in consistency. 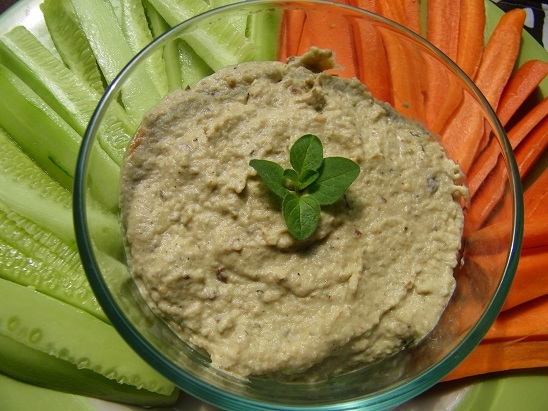 Serve with pitas, veggies, or crackers. Enjoy! Yummm! I never made this befote but tasted it several times! 🙂 I will use my home grown aubergines here! 😉 MMMMMMMM!